Today we'll be stepping back from our usual custom wallpaper imagery inspiration to focus on a new pattern we'll soon be launching on Wallgazer. the new wallpaper design is titled "Gold Rush." Gold Rush was designed by artist and graphic designer Andi Kubacki, and may be printed on our traditional wallpaper. 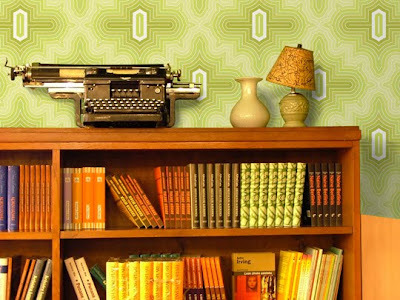 It may also be printed on our peel and stick wallpaper, which is becoming very popular. We've entitled the pattern Gold Rush because the line work is reminiscent of the flourishes that were added to painted signs during the California gold rush. Additionally, the outline of the pattern draws allusions to stitching you'd find on the seat of old school denim jeans. And while the line work is very interesting, the negative space created through the pattern lends a bit of fluidity to the design. The Gold Rush wallpaper design will be available shortly, but currently we have dozens of newly imagined wallpaper patterns and wall murals available at Wallgazer. Shop the site now for the most recent current custom wallpaper offerings available today. If you're looking for photo murals on wallpaper, be sure to check out our main website. There you can also submit your image for your very own custom wallpaper installation that features your artwork or photography.